Outside Buda Castle’s back gate, on a narrow saddle with sensational views over the valleys to the west of Buda, artisans sell traditional costumes, hand-made wooden goods in bright primary colours and table-linen with exquisite embroidery and lace. 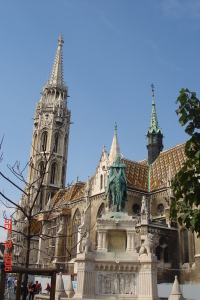 In the distance are the distinctive towers of St Matyas Church which stands in a sunny square next to a statue of Istvan, the first King of Hungary. 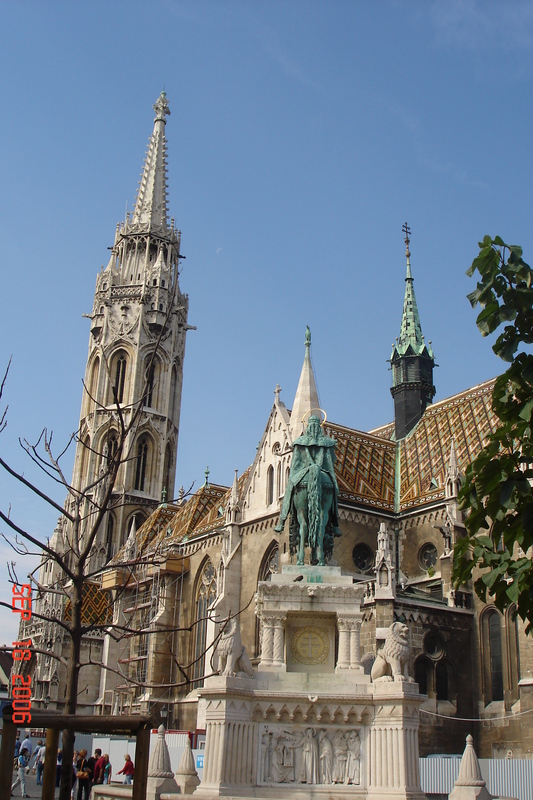 Built between 1255 and 1269 and dedicated as the church of Our Lady, it has come to be known by the name of the great ruler, Matyas. The king celebrated his two marriages in this church. He also extended and redecorated it, adding his symbolic crow to the spire. St Matyas was renovated again at the time of the Dual Monarchy by the architect Frigyes Shulek. Today its long journey across the centuries and the many hands that have shaped it are reflected in its rich mix of architectural styles. Pieces of the lives of the monarchs who worshipped there are displayed inside the church. There is a robe embroidered by the wife of the Emperor Franz Joseph on the death of their son and a fragment of her platinum embroidered wedding veil. On the rear wall is a fresco depicting a scene from the battle where Matyas’ Father, Janos Hunyadi defeated the Turks in 1456. On the other side of St Matyas is another Frigyes Shulek architectural wonder, Fisherman’s Bastion, which was built in 1905 to remember the fishermen who defended Buda against the 15th century Turkish invasions. Its pink-tinged stone minarets stand against the Buda skyline and its arched windows look east across the Danube to Pest.